This incredibly comforting dish is a real crowd pleaser if you have guests over- but you might not want to share it! By charring our onions and leeks at the start of the recipe we get a real hearty depth of flavour to the sauce- and the crispy, spongey bread bites soak that up perfectly!…..
Have the wood fired oven at around 450 degrees with a small flame presence and some embers present. In a cast iron pan or casserole (anything with a lid!) place the mussels, wine, butter and chopped veg. Season lightly and cover with the lid. Pop the pan into the oven, close to the fire for around 4 ½ minutes. 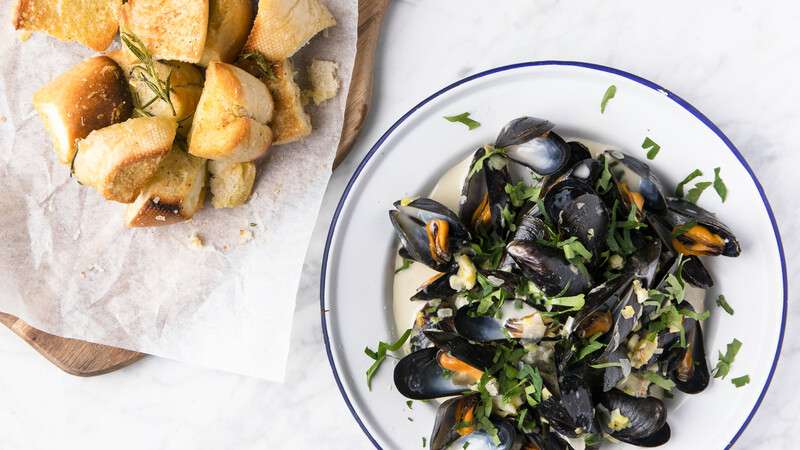 When the time is up on the mussels, remove the lid and add the cream. Pop the lid back on and return to the oven for a final 1-2 minutes.